Eleven years ago, when I first started investigating the Byzantine chant repertoire of Orthodox sacred music, my friend Mark Powell gave me some advice — track down the Divine Liturgy recording by Lycourgos Angelopoulos and the Greek Byzantine Choir. Hard to find, he said, but it’s the real deal. I did indeed track it down — I couldn’t find it on Amazon or on any of the usual CD websites, but I eventually found a Canadian retailer who specialized in Greek things who had it. I remember popping it into my CD player and not having any idea what to expect, and the first “Ἀμήν” just about knocked me out of my chair with its wall of men’s voices. That CD became my benchmark for what good Byzantine chant sounded like. Other discs became other benchmarks; Cappella Romana’s Divine Liturgy in English became the benchmark for good Byzantine chant in good English, for example. In terms of a general snapshot of the sound of Byzantine chant done well, however, the Angelopoulos Divine Liturgy remained the standard. At some point, the label Opus 3 made new stock available of the Divine Liturgy disc. It became the kind of thing that I would make sure to have extra copies around, and over the span of a few years, I gave away countless of them to people. A couple of years ago, Opus 3 apparently discontinued it, and it’s back to being scarce. Too bad. I discovered other recordings by the Greek Byzantine Choir — their Koukouzelis disc, their Mother of God disc, their Christmas disc, the Akathistos Hymn, the anthology that alternates their recordings with some by the Serbian Orthodox singer Divna, and so on. I also found my way to Angelopoulos’ recordings with Marcel Peres and Ensemble Organum. These recordings were all gateways to different corners of the tradition, and each one became both a treasure and a learning tool. Five years ago, I had the chance to go to Greece for the summer. I wrote Alexander Lingas a note asking, whom can you recommend for Byzantine chant teachers in Athens? His suggestions were Lycourgos Angelopoulos and Ioannis Arvanitis, and essentially, he said, it boiled down to language. They themselves were exemplary students of the same teacher, Simon Karas, but Angelopoulos spoke no English, really, only Greek and French; Arvanitis spoke very good English. Well, I opted for Arvanitis — I speak some French and I was in Greece for an immersion Greek program, but I didn’t really want my chant education to be in a language that was itself still in progress for me. I studied with Arvanitis all summer while attending Agia Irini, the church in Athens where both he and Angelopoulos chanted, so I certainly heard plenty of the psaltic ethos represented on the Divine Liturgy disc in person while I was there. After that experience, I developed other 1-degree-away connections; John Boyer, certainly, who was a student of both Angelopoulos as well as Arvanitis; Alexander Lingas, whom I got to know a bit better at Oxford Patristics in 2011; my friend Taso Nassis, a Chicago psaltis who had also studied with Angelopoulos and Arvanitis for years, was personally very close to both, and had absorbed just about everything both had to offer. Another friend, Brian Whirledge, went to Athens a couple of summers ago to study with Arvanitis, and he sang for Angelopoulos at Agia Irini while he was there as well. Somewhere along the way, I also developed an awareness that Byzantine chant had its own internal squabbles, and that Angelopoulos and Arvanitis (and, by extension, the friends I had made in connection with them) tended to be seen as on a particular side of those squabbles. I still don’t really understand what that’s all about, and I don’t really need to understand; suffice it to say that I’ve always been grateful for both what I’ve been taught and how I was taught it. Three days ago, Sunday morning, I had the good fortune to be singing Orthros and Divine Liturgy with Cappella Romana at St. Sophia Greek Orthodox Cathedral in Los Angeles. To be joining Cappella as a psaltis for concerts and services of Byzantine music was, in many ways, the closing of the circuit that was started all those years ago when Mark, Cappella’s Executive Director, told me to find the Angelopoulos Divine Liturgy disc. Further, we were singing a lot of things that morning that one hears on that recording. Towards the end of Liturgy, one of the psaltes checked his phone, and suddenly he was trying to get Alexander Lingas’ attention. Alex saw the phone, looked dismayed, and made the Sign of the Cross. My colleague showed me the phone — “Lycourgos Angelopoulos has died”, said the headline. As part of our encore that afternoon, Alex gave a brief memorial speech about Angelopoulos, and we sang “Memory eternal” before launching into the medieval melody from Jerusalem for “Χριστὸς ἀνέστη”. Shortly thereafter I got a text from John saying that he was heading out to Greece the next day for the funeral. While I never met Lycourgos Angelopoulos, it is safe to say that both in terms of his professional as well as his personal output, he had a great deal of influence on my development as a church singer and as an Orthodox Christian, even as I have been but an outlier in that structure. It seems a fair observation that what Metropolitan Kallistos (Ware) has been for theology — a strong center of pedagogical gravity and the hub of a far-reaching network of students — Lycourgos Angelopoulos has been for the psaltic art. He has been Libanius for Byzantine chant, perhaps. Lycourgos in antiquity may have been Νομοθέτης, the Lawgiver; perhaps this Lycourgos may be fairly remembered as ψαλλοθέτης. The psalterion at Agia Irini stands empty, and none shall take his place. Καλό ταξίδι, Δάσκαλε. Αιωνία η μνήμη σου. Ζωή σε μας. Αιωνία η μνήμη του Δασκάλου! Ζωή σε μας! May the memory of our beloved teacher be eternal! The joy I have experienced these last few days with my classmates, friends and parents during festivities surrounding graduation from Holy Cross Greek Orthodox School of Theology is tempered today with the sad news of the passing of my beloved teacher in the art of Byzantine Chant, Archon Protopsaltis Lycourgos Angelopoulos. I began studies with Mr. Lycourgo in the Summer of 1996 and remained in frequent contact with him over the last 18 years – half of my life. Never have I met a more dedicated teacher in the Psaltic Art; Lycourgo had hundreds of students over the last few decades, many of whom went on to become great cantors in their own right, others who became great scholars in Byzantine Music, others who went on to become clergy, still others who took the knowledge and skill he passed on to them to their ascetic lives in monasteries and convents. The Clan of Angelopoulos students reaches the far corners of the earth, as do the scores of recordings of his groundbreaking choir, Η Ελληνική Βυζαντινή Χορωδία (The Greek Byzantine Choir). A controversial figure, to be sure, those who know him personally know him to have been a loving yet strict taskmaster, a consummate teacher, a faithful Christian, extraordinarily generous, with a witty sense of humor and a voice that could move mountains. I have had the honor of chanting with my beloved teacher numerous times in many different venues, most recently at his home parish of St. Irene’s in Athens last Summer. I will never forget the sound of his voice, the twinkle in his eye, his inspiring and moving chanting and his profound gift for directing a choir. Who I am today as chanter, teacher and conductor I attribute greatly to the time I was so blessed to spend with the great Lycourgos Angelopoulos. I can only aspire, along with many others of his students, to carry on his torch of Byzantine Music, especially here in the United States, not simply as cantor but as teacher, conductor, composer and promoter of this traditional liturgical music of the Greek Orthodox Church. Αιωνία η μνήμη αυτού. Ο Θεός να τον αναπαύσει. May his memory be eternal. May God lay him to rest. Χριστός ανέστη! Christ is Risen!!! The psalterion at Agia Irini stands empty, and none shall take his place. I am not otherwise familiar with the work of Robert Kyr, but this intriguing collaboration with Cappella Romana and the Third Angle New Music String Quartet (actually a trio) makes me very curious to become so. As performed on Cappella’s new CD release, A Time for Life: An Environmental Oratorio is a moving musical dialogue between Judeo-Christian and Native American prayer texts about the created order and our relationship to it. Kyr here has constructed a libretto that brings together portions of two different Orthodox texts, the Akathist in Praise of God’s Creation and the Office for the Environment (observed on 1 September by the Ecumenical Patriarchate), as well as selections from the Psalms, Jeremiah, Isaiah, Ecclesiastes, the United Nations Environmental Sabbath Service, and prayers and hymns from the Sioux, Navaho, Pawnee, Ojibway, Chinook, and Netsilik Inuit tribes. It is in three parts: Creation, Forgetting, and Remembering. Kyr’s structure seems to express the idea of our present-day ecological concerns being a function of the fall of mankind; we were created first in right relationship with God and creation, but in our hubris we chose our own way over God’s, harming our relationship to both. Parts II and III express this right relationship in terms of memory; “We forget who we are; help us to remember” is the refrain throughout Part II. Part III weaves together the different ways all of the texts use the idea of remembering. “O Lord, help me to remember who I am”, says the Orthodox Office for the Environment; “Remember, remember the circle of the sky,” replies a Pawnee/Osage/Omaha song. If we can but remember, we will be able to repent; “Restore my mind for me,” the words of a Navaho chant plead. Repentance, as Kyr’s own words then tell us at the end of the peace, will then allow us to understand, to rejoice, and to appreciate the beauty of God’s created order. Kyr does a very nice job of arranging these texts so that the dialogue never seems forced; he seems to want them all to speak on their own terms, in their own spirit. I am familiar with similar attempts to interweave religious texts from different traditions that do not give them the same respect; Giles Swayne’s Stabat mater, for example, is principally interested in using other texts to marginalize the particularity of the Virgin Mary’s lament at the cross. Musically, Kyr’s language here is not the angry, mushy, ambient noise that so much contemporary music can be; rather, the interplay with the voices and his adeptness at sung musical phrases reminds one more of Britten (and, often, Britten’s own invocation of Purcell). His music is restrained and tasteful, allowing the texts and ideas to be front and center. The “We forget who we are” refrain in Part II is particularly haunting, as I suppose it should be. For Cappella, this CD is something of a departure; while concert works informed by Orthodox liturgical music are nothing new for the ensemble (see, for instance, Richard Toensing’s Kontakion on the Nativity of Christ and Fr. Ivan Moody’s Akathistos Hymn), this is not really a choral piece but rather a piece for a solo octet, and while they have recorded with orchestra before as well as with organ, this seems to be their first time on record with a chamber music ensemble. It is nice to see Cappella championing repertoire like this; it demonstrates an impressive artistic vision. Happily, the performance on the disc demonstrates a very real breadth of ability that is equal to that vision. All of the soloists do marvelously with the score; in particular, Mark Powell and LeaAnne DenBeste — who was excellent as the Mother of God soloist in the Toensing Kontakion — are excellent, with crispness of diction and clarity of voice that serves Kyr’s music very well. The Third Angle New Music string trio accompanies the solo octet with a lot of sensitivity, but they are also present enough to never sound like they’re holding back in order to be a “pit band”. The booklet contains the complete libretto of the oratorio, as well as essays from Dn. Dr. John Chryssavgis, Kyr, and Cappella’s Artistic Director Alexander Lingas. The essays are very much worth reading; they provide useful context for Kyr’s composition, Cappella’s own involvement with its performance and recording, and the interest and theological perspective of Ecumenical Patriarch Bartholomew as regards environmental concerns. I believe that music and the arts have a crucial role to play in the transformation of the current energy of cynicism and destruction into the life-sustaining attitude and energy of creativity. Indeed. Go and do likewise. those produced by Greek American composers remain little known. Indeed, Orthodox Christians from Europe or the Middle East visiting Greek Orthodox churches of the United States are frequently surprised or even scandalized to hear the Sunday Divine Liturgy sung not by cantors employing Byzantine chant, but by a mixed choir singing harmonized or polyphonic music that is often accompanied by an organ. Viewed from such an outside perspective, Greek American liturgical choral music would seem to be little more than a peculiar — or, as some critics of polyphony would maintain, an ill-judged and extreme — instance of inculturation. While there can be little doubt that ideologies promoting cultural adaptation (or even assimilation) to prevailing cultural norms have influenced the development of liturgical singing in Greek America, emphasis on these aspects of its history can all to easily lead to facile dismissals that ignore its many complexities of provenance and expression. Wow, that’s a mouthful for a CD booklet, isn’t it? And yet, there it is. As one tasked with reviewing this particular disc, I feel that I must unpack this a bit to give the recording proper context for people who may not be familiar with the issues to which Lingas refers. This is going to be rather subjective and impressionistic, but I think it all has to be said before I can write my review. Who gets the final say of what constitutes what something “should” sound like? What is “authenticity”? What’s “authentically” American? What’s “authentically” Orthodox? What’s “authentically” “authentic tradition” or, more specifically, “authentic sacred music”? Can something be “authentic” to the “lived experience” of some Orthodox but not others? How do you work out the question of the authority to resolve such questions? We can appeal to Tradition — but interpreted by whom? Is it up to bishops? Bishops can be wrong. Is it up to musicians? Musicians can be wrong. Is it up to “the people”, whatever we mean by that? “The people” can be wrong. How do you deal with change within a rubric of Tradition so that you are neither unnecessarily reactionary nor unnecessarily innovative? 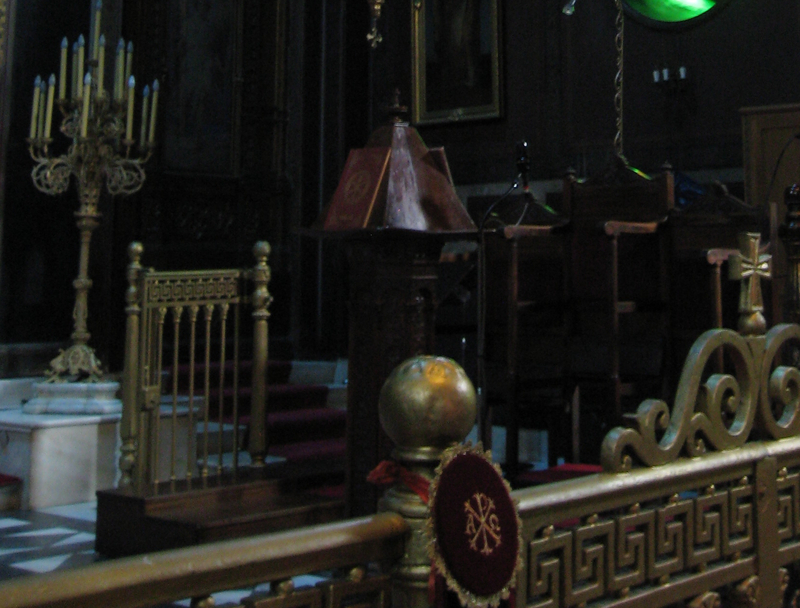 Historically, instruments have no place in Orthodox worship; organs are a recent development in some Greek parish churches in the United States, but those are generally examples of communities that have moved into pre-existing buildings that already had organs, and then simply adapted to what was there. My first glimpse into just what disagreements there could be over Orthodox church music was when Vicki Pappas, the then-National Chair of the National Forum of Greek Orthodox Church Musicians, came to the Gretchianinoff concert. She talked to me about the notes afterward and said, “Very good on the whole, Richard, but that’s just not true about organs. Greeks love their organs, and have built many churches with the intent of having them.” That seemed quite contrary to what I had been told up to that point about a cappella singing being normative, and I wasn’t clear on where the disconnect was. Little did I know. Last year, the Saint John of Damascus Society was asked to write a script for an hourlong special on Orthodox Christmas music that would have been aired on NPR. I wrote the script, but for various reasons the full program shrunk down to a segment on Harmonia instead. Anyway, as I was writing the segment and assembling the program for it, one of the people I was consulting with objected to Cappella Romana‘s recordings being used for some of the contemporary Greek-American polyphonic composers like Tikey Zes. “They sing Tikey’s music like it’s Palestrina,” this person told me. “Real Greek Orthodox choirs don’t sound like that. Let me get you some more representative recordings.” The problem, though, was that the recordings this person preferred weren’t really up to broadcast quality. They were more “authentic” to this person’s experience of how the music is used in church, but they were problematic to use in a setting where one needed to put the best foot forward. Coming from an Anglican background, this struck me as an odd criticism, and it still does. My church choir in Bellevue didn’t sound anything like the Choir of King’s College at Cambridge, but I would certainly rather give somebody a King’s CD if I wanted them to get an idea of what Anglican music sounds like rather than get an ambient recording of a service of my old choir. Is it representative of what it “really” sounds like? Is it representative of what it should sound like? I can’t definitively answer either question, but it’s the ideal of sound I have in my ear for that repertoire. Whether or not the average parish choir sounds like that isn’t really the point. Still, that’s an argument that doesn’t satisfy the “lived experience” criterion. At the same time, the presence of robed choirs and organs means that there’s some jostling that happens with people for whom the Orthodox Church’s traditional repertoire is chant, period, with opinions strongly held on both sides. There’s the issue that the Ecumenical Patriarchate issued an edict in 1846 forbidding the liturgical use of polyphonic music, and I don’t think that anybody denies that this exists, but it seems to me that there’s a good deal of disagreement about just what it means for American congregations in 2013. In any event, the fact that Orthodoxy still usually follows the one-Eucharist-per-altar-per-day canon means that you can’t split a church community along musical lines exactly, but nonetheless the solution in a lot of places is to institute aesthetic fault lines between services. Generally, what this looks like is that that Matins/Orthros is the domain of a lone cantor (or two or three) up until perhaps the Great Doxology, at which point it’s taken over by the choir. This interrupts the intrinsic unity of the services as they are intended to be served according to present-day service books, but it’s a solution. Speaking personally, I have put a good deal of time and effort over the last several years trying to become at least a competent cantor, and I’ve experienced the glory that is Orthros and Divine Liturgy being treated as a seamless garment sung in one musical idiom by the same people throughout, but I’m also not fundamentally thrown off by the presence of a polyphonic choir singing polyphonic repertoire. While I’m thinking about it — I was surprised to discover that there is not, exactly, agreement over what exactly constitutes “Byzantine chant”. As I was taught, “Byzantine chant” indicates a particular process of composition of monophonic melodies for Orthodox liturgical text, employing a particular musical idiom with its own relationship to the text, theoretical characteristics, notational system, vocal style, and practice of ornamentation, informed by oral tradition (or, to use words perhaps more familiar to Western musicians, “performance practice”). In other words, it is not a fixed, bounded repertoire, but rather a living tradition; you can compose “Byzantine chant” for English texts by following the compositional process and sing the result with the proper style and performance practice. For English, this perspective probably prefers the work of Ioannis Arvanitis, Basil Crow, Papa Ephraim at St. Anthony’s Monastery, John Michael Boyer, and the like. This is also essentially the point of view presently taught at Holy Cross Greek Orthodox School of Theology by Dr. Grammenos Karanos (more about them here). At the same time, I’ve encountered the point of view — from both cradles and converts, people who are theoretically knowledgeable and people who aren’t — that that’s not Byzantine chant at all. Byzantine chant, according to some, actually is a fixed, bounded repertoire for Greek and Arabic; for one reason or another, so this point of view goes, a fresh setting for an English text might be a number of things, but it isn’t Byzantine chant anymore. (Either because the compositional process is imperfect for English, doesn’t work at all for English, or is irrelevant in the first place, depending on to whom one speaks.) The whole idea of formulaic composition here is set aside; it’s the melody that already exists that’s important, not the relationship of the melody to the text by way of those melodic formulae, and that melody needs to be preserved for it to still be “Byzantine chant”, even at the expense of proper formulae or orthography. This perspective would find, for example, Fr. Charles Baz’s transcriptions of the Basil Kazan Byzantine Project into Byzantine notation not just acceptable, but preferable to the work of the composers mentioned above. And then there are still other “sides” within what I’ve outlined above. The bottom line is, there is more than plenty to argue about where music is concerned. For my own part, I try to be a specialist but not a partisan, and I think context matters. I don’t think that means “anything goes”, but to the extent that traditions of liturgical crafts have historical contexts (even Byzantine chant! ), I’m not sure how much it accomplishes to pick fights. Part of the problem, as I’ve experienced myself, is that there aren’t a lot of people who are sufficiently well-trained Western musicians and Byzantine cantors, such that they can adequately participate in, or even comprehend or relate to, both contexts. There are some, but not many, and there’s generally not a lot of interest on the part of one “side” in learning about how the other “side” does things. I am able to go back and forth between the psalterion and the choir loft to some extent — I suppose I’d say I’m equally clumsy in both contexts — and I’m interested in what goes on in both, but I have my own opinions that I bring with me, certainly. (You don’t say, you’re both thinking.) I don’t like the hodgepodge of whatever random music might be thrown together that it seems to me that the choir loft can become. I don’t like a structure of liturgical responsibility that effectively tells a cantor, “We want you to cover all of the services that nobody comes to” (let’s be honest here). At the same time, if “Byzantine chant” is understood principally as “what the old guy whose voice is nasal and can’t stabilize on a single pitch, and who should have stepped down 25 years ago but didn’t because there wasn’t anybody to take his place, does before Divine Liturgy”, then that’s its own problem, one that we cantors need to be proactive about fixing. In general, we church musicians, cantors and choristers alike, need to be a lot more proactive about, shall we say, reaching across the nave and educating ourselves about our own musical heritage and where the stuff we might individually prefer actually fits in. Okay, so then there’s the question of how an ensemble like Cappella Romana fits into this picture. As a professional choral ensemble that specializes in a particular kind of repertoire — Orthodox liturgical music in all of its variety — but one that is also led by a Greek Orthodox Christian and that has a substantial, though not exclusive, Orthodox membership on its roster, what is their role? Do they have a responsibility to follow a particular ecclesiastical agenda, even though they’re not an ecclesiastical organization? To put it one way, is their job descriptive or prescriptive? Are they a de facto liturgical choir that is only to record and perform in concerts the music that “should” be done in churches? Or, as a performing ensemble first and foremost, are they perhaps the kind of ensemble that should be exploring repertoire like Peter Michaelides, medieval Byzantine chant, Fr. Ivan Moody, and so on? Maybe they get to be the King’s College Choir, as it were, that records and performs things that would likely never be used liturgically, nor be appropriate to be used liturgically. But then, just as the Choir of King’s still sings daily services, Cappella has its “pastoral” projects, like The Divine Liturgy in English, where they are most definitely trying to disseminate an ideal of sound for churches to emulate. Alas, in some circles this argument of a two-sphere approach generates the the rather grumpy insistence that “Orthodoxy doesn’t do art”, or at the very least that art is a luxury that Orthodoxy cannot afford in in its current context in the New World. To me, that’s absurd, but as I have my own Orthodox artistic music project in the works, perhaps I’m not the most objective of critics where that point of view is concerned. At the very least, even if one is to ultimately dismiss liturgical use of the repertoire, I might suggest that Greek-American choral repertoire, not unlike the Greek idiom of vernacular music known as rebetiko, is worth understanding on its own terms at a musical and sociological level. (If you’re wondering what I mean by that, a full discussion is perhaps beyond our present scope, but I might submit that Greek American choral music, like what I understand is the case with rebetiko, can be seen as essentially a folk repertoire born in a context of emigration.) At any rate, thank God that it’s an ensemble like Cappella Romana taking it on, where the leadership and at least some of the membership have an intimate understanding themselves of the various elements at play. And finally to the CD itself, which, because of the reasons mentioned by Lingas in the essay and what I discuss above, is in the unenviable position of not being able simply to be a recording of sacred music, but rather a recording that must be interpreted as a statement of something by people who don’t want the music contained therein legitimized, AND by people for whom this is the right music, but the wrong way to sing it. Jeffers Engelhardt, can you help me out here? Well, to give you a capsule review (full review will be in the next post, now that I’ve got all of this stuff off my chest), if you come to the disc without needing it to be a statement of anything in particular, you will find that it is a beautifully-sung recording of some gorgeous music. The essay in the booklet about the music’s historical context is fascinating, both for what it says as well as what it doesn’t say. And yes, Cappella sings Tikey’s music like it’s Palestrina, and you know what? It sounds glorious. So, “authentic” or not, works for me. Something that I’ve been paying a good deal of attention to in the last year is the Icons of Sound project at Stanford University. Art historian Bissera Pentcheva has been involved in piecing together a working model of the aesthetic environment of Hagia Sophia, and the work has involved a recreation of the Great Church’s acoustics. Strategically placed (to say nothing of carefully negotiated with the Turkish government) balloon pops in the cathedral provided an audio sample sufficient to generate a computer model of the building’s resonance and decay, and they called in the big guns, Cappella Romana, to record some things that would demonstrate the model’s efficacy. An initial proof of concept of the project was published in the form of the stunning video found on this page. The project has proceeded from there, and this weekend is a huge development — Cappella Romana doing a weekend residency at Stanford and presenting two concerts in the university’s new state-of-the-art Bing Hall. These concerts will involve setting up a sound system that uses the computer model of Hagia Sophia’s acoustic; the ensemble and the audience will, in theory, experience the music as though it were being sung in the Great Church itself. I really wish I could be there, no question about it; if you live anywhere near Stanford, tickets are still available for Saturday evening’s performance. More information is at the Cappella Romana blog, and there’s also a fascinating article about the project in Stanford Live Magazine. If you’re somebody who is going to be at one of these concerts, I’d love to hear about your experience. CORRECTION, 8:04pm — I am told that Saturday’s concert is in Memorial Church, not Bing. Thank you for letting me know! Much has happened in the last few weeks that I’d like to offer some reflection on, but some of it, it seems to me, needs more context in order to make sense. So, I will try to catch up a bit first with this story, already in progress. The period being covered here is approximately summer 1997 through summer 2003. In the previous installment of “Richard’s Religious Navel-Gazing”, I found myself at an Episcopal parish for professional reasons and wound up staying for confessional reasons, and it was a transition that I ultimately had to make by myself. That summer, I was adjusting to a new job — more or less my first “real” job — I was trying, unsuccessfully, to end a relationship, I bought my first car, I was trying to figure out how in the world I was going to undo some vocal damage, and I was also trying to fully embrace life as an Episcopalian. I was also taking on some of my first “real” professional gigs; I joined the tenor section of the Tudor Choir for a good chunk of their 1997-8 season, which was part of what necessitated the car purchase — I needed to be able to drive to Seattle for rehearsals. A couple of things struck me very early on as an Episcopalian; first, at twenty, I was the youngest person attending independently at St. Paul’s by at least a decade if not more like two. Where were all the Episcopalians our age? I asked rhetorically of my longtime friend who had told me I didn’t belong at Overlake. “Well,” he replied, “what in the world has the Episcopal Church ever done to make people our age the slightest bit interested in what they’re doing?” He had become a firm believer that Christianity could no longer make any assumptions whatsoever that those who walked through their doors had any idea what either Christianity was or what churches were supposed to be like, that previous models had for all intents and purposes failed the current set of generations, and that we had to start over with words and images and practices and so on that today’s people would actually understand. A church organization that theoretically made continuity of their liturgical and musical heritage a priority was incomprehensible from such a perspective. I will say that even if my friend didn’t see what the Episcopal Church was doing for people our age, however, and even if our church building had hours of operation predicated upon a “Sunday-only” model, I could nonetheless see how St. Paul’s was active within the greater community. The church made itself available for concerts and organ recitals, and it also hosted a “town meeting” when Bellingham’s first drive-by shooting occurred. They’ve also started their own school. At the same time I was wondering why St. Paul’s wasn’t doing more than Sunday Eucharistic liturgies, I was learning to sing music with the Tudor Choir that drew heavily from that richer liturgical tradition. The first concert I sang with them was titled “Taverner/Tavener” in September of 1997, which introduced me to a number of liturgical and musical concepts for the first time — antiphons, motets, the Trisagion, and ison. (Ison, as contributed to by David Stutz, generated the sensation, even in the rehearsal room, of being strafed by a formation of fighter jets. Accept no substitutes.) It was also the first time I ever heard of Cappella Romana or met Alexander Lingas, since it was a joint concert with CR and Dr. Lingas had just returned from a postdoc at Oxford. I had met Mark Powell before, since he was the tour consultant for a European tour that WWU’s Concert Choir was taking during the summer of 1997. I didn’t go because I had dropped out, but I certainly remembered Mark. Commuting between Bellingham and Seattle for Tudor Choir rehearsals (and, eventually, voice lessons back with my first teacher) saw me staying in Seattle during a few weekends. I struggled mightily with where life had led me at this point; I was a college dropout, I lived someplace I didn’t want to live, I was working in a dead-end job, I was in a relationship that I had no business being in, and I had no idea how to get out of it. Some people I knew from church were encouraging me to consider the priesthood, but without finishing a degree, seminary wasn’t going to be an option, and the woman I was involved with was not somebody who would easily fit into the category of “priest’s wife” by any stretch of the imagination. (Incidentally, that’s not intended to be a knock; she was a lovely person in every way. It’s just a statement of fact.) All of this found me despairing as I was driving around the little Eastside town of Kirkland late one Friday evening after a Tudor Choir rehearsal. I found myself, rather unexpectedly, in front of St. John Episcopal Church. I parked and walked around the darkened church building for awhile; at some point, I tried the doors, expecting them to be locked. They were not. I went in, and there was one flickering candle burning in the nave. I sat down in one of the pews, looked at the candle, and let self-pity wash over me. What happened next is the kind of thing I don’t write about much because it’s only happened to me perhaps three times total, maybe four. For a certain kind of Christian, I suppose, these kinds of occurrences are presumed to be normative; I must be honest and say I’ve never trusted that, because it’s the kind of thing that’s too easy to manufacture, to either convince yourself that it happened or fabricate it for somebody else so that they think it happened, and who is anybody to argue, since by definition the whole thing is subjective and unverifiable anyway? All of that is to say, I mention this expecting skepticism, and that’s okay. I wouldn’t mention it at all except that it’s an experience I point to as a moment on the other side of which things went in a different direction. As I was sitting there in the candlelit church and wallowing in my own unhappiness, I became aware that there was another physical presence in the nave. I had the sensation of this presence putting an arm around my shoulders. I know, this presence said, and I’m sorry. Will you trust me now? I don’t have any particular memory of giving an answer. Still, I was aware of a sense of peace that was replacing the despair. None of my problems were solved, and I had no idea how any of them would possibly get worked out, but I felt that I could have faith that things would work out for the best one way or the other. Two days later, I attended St. John’s Sunday morning service. The Rt. Rev. Sandy Hampton, our diocese’s suffragan bishop, was visiting that day; he gave a sermon from which I don’t remember any of the substance, but I felt truly comforted in a way that built upon my experience two evenings before, and when Bp. Hampton invited anybody in the congregation who wished to renew their baptismal vows with those he was confirming, I went up and joined them. From there, many things in my life changed rapidly. By February of 1998 I was back in the Seattle area, having been afforded an opportunity to pretend to work for the software industry, and I was all too eager to take advantage of it. Initially, when I relocated, it seemed to make sense to me to attend St. Mark’s Episcopal Cathedral; I had a number of singer friends who were there, and they appeared to have a rich liturgical life and community presence. There were a number of things about St. Mark’s that I found off-putting, however, such as a penchant for apologizing for the things expressed in the liturgy while they were being expressed. “Let us affirm our faith in the fourth century words and images of the Nicene Creed,” was something the canon said in the liturgy at St. Mark’s, for example, which left me scratching my head. If you’re going to qualify it in that way, why bother at all? The moment when I realized that I didn’t belong there was Easter 1998, when they had a brass band, a string quartet, lots of majestic music and pomp and circumstance, but Dean Fred Northup’s homily didn’t once mention the Resurrection — in fact, he seemed to be going out of his way to avoid mentioning it. Well, okay, if the Resurrection isn’t worth mentioning on, oh, I don’t know, Easter, then what’s the freaking point, Father? I could recognize some of the good that St. Mark’s was trying to do by being the way they were, but I didn’t see for a moment how they were actually being a Christian church if they weren’t willing to affirm Christian teaching. “Unitarians with prayerbooks” was a phrase that escaped my lips, and not for the last time. I wasn’t quite sure what to do; I wanted to see this whole being an Episcopalian thing out, but the only other church community in the area that I knew I would feel comfortable at was Northlake Lutheran. I paid them a visit, but it had been four years by this point and nobody really remembered somebody who had only been there for a few months to begin with. I lived five minutes away from an Episcopal church, St. Margaret’s, but I hadn’t been there — somebody had mentioned to me that they were a bit “weird”, so it hadn’t occurred to me to go. Finally, one Sunday, I just decided to go ahead and go since it was close. It was a lovely little church, they had a more or less decent choir and organist, they served the liturgy in a reasonably straightforward manner without any apologizing for it, and they had a really nice group of clergy in Steve Gehrig, Wally Bristol, and Rachel Endicott… but yes, it seemed a bit “weird”, in that nobody except Fr. Steve seemed to take the slightest notice that there was a visitor, and for somebody who was all of 21, had no family around, and who was going to church on his own, that really wasn’t a great feeling. I went again, and had a similar experience; that day, however, Fr. Steve encouraged people to fill out feedback forms, and I figured, what the heck. I said, in essence, lovely place, but for somebody who’s looking to fit in with a community, you guys seem like an awfully closed group. A few days later, I got a voicemail from Fr. Steve that said, I’m so sorry, please forgive us, if you come back and give us another chance I promise you we’ll do a better job. I later found out that I was hardly the first person to offer this critique of St. Margaret’s, and that Fr. Steve often had harsh words for the congregation when things like this happened (as I heard for myself once or twice in the following 5 years). So, I went back, and yes, it was a much different experience. Most importantly, it started a friendship with Fr. Steve that I really valued; he was a spiritual father to me in many ways, even in a tradition that didn’t necessarily know those words, and I am thankful for his presence in my life to this day. He was one who strongly encouraged me to consider the priesthood, and he also assured me — after I had inquired — that if I wanted to give a confession, he was willing to hear it (rare in my experience amongst Episcopal clergy). Neither of these ultimately went anywhere, but the things we talked about in the context of those encouragements got me thinking along lines that led me to start reading Catholic apologetics. Not because, at that point, I thought I would leave the Episcopal Church, but rather because I was starting to think of myself as an Anglo-Catholic, and I wanted to develop a better understanding of what the “Catholic” side of that meant. Still, there was a very real way in which I continued to feel like neither fish nor fowl. I was, again, the youngest person attending independently, and I was again left wondering why we didn’t at least do Choral Evensong one night a week or something like that. The answer in this case seemed to be because The Other Episcopal Church in Bellevue (The One That Was Big, Rich, and Liberal) was renowned for a beautiful Sunday evening Choral Evensong service, and St. Margaret’s didn’t want to be anything like them. St. Margaret’s had some vibrant community outreach going, including a thrift shop located in a park and ride, and they had a ten-year vision for how to keep it up that included building a new church building that would accommodate all of their intended ministries, but I continued to wonder, where are all the Episcopalians my age? They weren’t at the Cathedral, they weren’t at St. John’s, they weren’t at St. Paul’s, and now they weren’t at St. Margaret’s, either. I tried inviting my friends; even Rite II was just too foreign to the suburban Evangelical experience to be anything remotely identifiable to them as Christian. Well, by the following spring, I wasn’t attending St. Margaret’s by myself anymore. I was now attending with the previously-mentioned Megan McKamey, who, despite having been functionally agnostic when I met her, had returned to Christianity, and who fell in love with St. Margaret’s after going with me once shortly after we started dating again. So, there was at least one more person my age there. To expand on what I just said — the best way for me to put the shift I was going through is that in the context of the liturgy, I would find myself confronted by certain theological issues as expressed in the service (yes, even in Rite II). In thinking about it, I concluded for myself that I either believed it as it was affirmed in the liturgy, or there was no meaning to the liturgy. The Real Presence in the Eucharist was perhaps the most obvious issue, but there were others. This was a slow process for me; it was maybe three years after my confirmation before I even felt entirely comfortable making the Sign of the Cross. Anyway, it was clear to me that many of my more liberal friends (inclusive of — and perhaps especially — former clergy) knew and and understood the significance of affirming something in the liturgy too, because they were very up front about telling me, “Well, that’s why I don’t say the Creed.” The more I went the other way, however, the more Anglo-Catholic I found myself trying to be — or, maybe more accurately, the more I found myself thinking in ways that I imagined Anglo-Catholics to think (remember we’re talking about the Pacific Northwest here). Megan was confirmed two months before our wedding, and our ceremony included a full Eucharist (and yes, there were family members of Megan’s who chose not to attend). Fr. Steve explained Communion to the congregation in the following way: “All can, some should, none must.” Megan’s dad received Communion; I didn’t know this at the time, but this was evidently the first time he had received since the divorce. As I understand it, this led to him taking steps to be reconciled to Rome so that he could commune again in his own church, and Holy Week of 2002, we found ourselves down at St. Patrick’s in Tacoma for his reconciliation and Megan’s stepmother’s baptism and confirmation. Over time, I found my interest in liturgy and sacred music continuing to develop, and I continued to wonder why, for a communion that supposedly prized itself on its liturgical heritage, it seemed like people were reticent to embrace much of it beyond an 11:15am organ and choir service for the blue-hairs (and the Barretts). In another somewhat proto-St. John of Damascus Society move, I started to explore the possibility of commissioning a program of Christian art songs (and this in fact yielded a lovely result in “Blessed are those who mourn”, composed for me by current SJDS advisory board member Matthew Arndt). In trying to generate interest at St. Margaret’s in supporting a fuller musical and liturgical program, I put together an adult education program about sacred music that was given over a few Sundays (and, alas, I can’t say it was terribly successful). Fr. Steve seemed to be sympathetic to my interests, but ultimately he seemed to feel that the future for St. Margaret’s lay with “contemporary” music and worship and the raft of young families that attended the 9am service. He had designed St. Margaret’s new church building to be basically a smaller version of a seeker-friendly megachurch that just happened to still have the Book of Common Prayer in the pews. Other adult ed opportunities at St. Margaret’s included a daylong workshop on rosary making, which Megan took to like a fish to water, and she started making a lot of them as gifts for family and friends. Another one was titled “Discover Your Prayer Style”, which on the whole I’m not sure was entirely productive (enneagrams? Seriously? ), except that it was my introduction to icons (which, I have to say, I found to be incredibly gaudy and pretentious in 2002). I continued to read Catholic apologetics, and Megan and I had some conversations about hypothetically converting (or perhaps “reverting” in her case) down the road. What would it mean? What would it look like? What would the circumstances have to be? We never came up with any definitive answers, but it had been very definitively on our minds since Holy Week of 2002. I apologized for my ignorance, and after the concert, Mark sat me down for sake at a Japanese restaurant and gave me “Orthodoxy 101”. This is who we are, these are our distinctives, this is why the filioque matters, this is what we believe about Christ, the Church, the Virgin Mary, and so on. It was all fascinating, particularly in comparison with the Catholic apologetics I had been reading, and I listened eagerly. After dinner, I went home and forgot about it entirely. In the fall of 2002, Megan and I were asked to serve as delegates to the convention for the Diocese of Olympia. This was, to say the least, a seriously eye-opening experience, and it disabused us of any notion that our experience at St. Margaret’s (to say nothing of my experience at St. Paul’s in Bellingham) was at all representative of what the Episcopal Church looked like in our Diocese. It opened up with our bishop announcing that he was getting a divorce, and the weekend also included St. Mark’s Cathedral trying to revise its governing structure so that it was a secular community center that happened to host church services, replacing “Father, Son, and Holy Spirit” with “Creator, Redeemer, and Sanctifier” lest masculine imagery be distastefully employed, and in general there were problematic sides of things I had never had a problem with before that were rearing their heads all over the place. On the whole, the face that the Diocese of Olympia presented to us that weekend was one of an organization interested in being a secular social services organ first, and a Christian church… ninth? Tenth? Twentieth? Up to that point, I had assumed that I would have an Episcopal funeral, that my children would be raised as Episcopalians, and that my wife and I would grow old complaining every Easter about how cheesy and freaking long “Hail thee, festival day” is. But after that weekend, such an outcome seemed terribly unlikely. We stayed put for the time being. But it became clear shortly thereafter that a geographical move was going to be in our immediate future, and it seemed like an opportune time for a confessional move. If you had asked us about it right then, we would have said that we assumed that meant Rome. Cappella Romana is an ensemble that’s hard to pin down. Are they an early music ensemble? Yes, sort of, but they don’t generally do Bach or Monteverdi. Are they a sacred music ensemble? Yes, but they’re not affiliated with a specific church institution (i. e., a cathedral or parish). Are they a world music ensemble? Sort of, since much of the music they sing originates in the Mediterranean, but not exactly. Are they a contemporary music ensemble? Yes, sort of, but much of the contemporary music they do is decidedly in an older tradition. Are they a pastoral, confessional affair? Of sorts, I suppose, although their membership is by no means entirely composed of Orthodox Christians. Are they a scholarly project? Well, yes, they’re kind of that too, given that the booklets tend to be article-length affairs with footnotes and bibliography. I suppose you could say that they’re an early world contemporary sacred music vocal ensemble that’s run by a musicologist. They’ve been extraordinarily productive in terms of recorded output in the last eight years; since 2004 they’ve put out some eight discs (ten if you include the compilation for the Royal Academy’s Byzantium exhibit and their contribution to the Choral Settings of Kassiani project) that have run the gamut — medieval Byzantine chant, Russian-American liturgical settings, a long-form concert work by an American master, Western polyphony, Greek-American polyphonic liturgical music, and Christmas carols (of a sort). Their recordings also continue to get better and better; I picked up their discography in 2004 starting with the Music of Byzantium compilation of various live and recorded excerpts, followed by Lay Aside All Earthly Cares, their collection of Fr. Sergei Glagolev’s music, and then 2006’s The Fall of Constantinople, a program I had heard them perform here in Bloomington. Comparing just those three discs to each other, there’s a noticeable jump in quality, and then comparing them to recent releases such as the Peter Michaelides Divine Liturgy, it’s clear that they’ve found a groove in the studio (as well as perhaps in the editing booth) and they’re riding it now. They’re recording music nobody else is really doing, and while that means it’s hard to know what an applicable comparandum for any particular recording might be, it’s clear listening to it that they’re doing it at a very high level regardless, and the good news about the lack of comparable recordings is that it reveals the sheer richness of the Orthodox musical heritage. Arvo Pärt and Rachmaninoff are great, but there’s much, much more that you can do. Mt. Sinai: The Frontier of Byzantium fits into this scheme by presenting music from late medieval Byzantine chant manuscripts from St. Catherine Monastery at Mt. Sinai, one of the key crossroads for Eastern Christianity. A Chalcedonian monastic outpost dating as far back as the days of Justinian in the middle of non-Chalcedonian Egypt, it is a treasure house of some of our earliest witnesses to the Christian iconographic tradition (since it was a place of refuge from the iconclasts), and its library of manuscripts in virtually every language of the Roman oikoumene is a witness to the catholicity of the Empire that produced them. The musical selections include portions of a Vespers for the monastery’s patronal feast, as well as the Service of the Three Youths in the Fiery Furnace, a quasi-liturgical drama that would have been served between Matins and Divine Liturgy on the Sunday before Christmas. The Vespers material is interesting, particularly how Psalm 103 is treated. It is something of a mix of reconstructed Palestinian practice and present-day Greek tradition, where the first three verses are sung antiphonally, and then Koukouzelis et al.‘s setting of the Anoixantaria (the section of Ps. 103 that starts with, “Thou openest thine hand, they are filled with good…”) is interpolated with Triadika, short refrains glorifying the Trinity. It’s an approach to psalmody (in the literal sense of the word) that is generally eschewed in modern American parish practice; we tend to treat whole psalms as something to get through as quickly and as plainly as possible. Of course, just singing the Anoixantaria can take as long as 20 minutes depending on whose setting one is doing, so when parishes want to get Vespers done in half an hour or less, that’s the way it is. Elements like this emphasize how, ideally, our worship needs to be unhurried; we’re on God’s time, he’s not on our time. The Service of the Furnace portion is lovely. It’s a real curiosity, liturgically speaking; the notes refer to it having been part of the practice of Constantinople and Thessaloniki (and subsequently Crete), and something that developed during the so-called “Byzantine ars nova“, where an artistic and spiritual flourishing was paradoxically occurring in the East at the same time as the political collapse. I’m left wanting to know more about how exactly how it developed, and why, and why it didn’t catch on elsewhere in the Orthodox world. There are several musical textures in the Furnace section, solo to choral, syllabic to highly melismatic, and they’re all handled with beautiful musicianship and and some of the best male ensemble singing you’re ever likely to hear on a CD. One thing I’d point out is that this actually is something that has been commercially recorded before and is more or less available, even if you have to know where to look for it. Lycourgos Angelopoulos and the Greek Byzantine Choir (EBX) recorded parts of it for a Polish release called “Byzantine Hymns”, and while I have yet to actually find this for purchase anywhere, you can find their rendering of the Service of the Furnace hymnody on YouTube. Obviously there’s a bit of a difference in approach; EBX tends to have a different vocal quality all around that I would describe as a little more suntanned and weatherbeaten, and they’re singing the material the way they sing at church every Sunday. EBX also employs a children’s choir for the Three Youths themselves, which is apparently the historical practice and sounds fantastic, but I can see several reasons why that might be an undesirable layer of complexity for Cappella’s presentation. One other thought — something that a recording like this might help to give a glimpse of is the vitality of the Christian tradition in the Middle East. St. Catherine’s Monastery is an Egyptian witness to a faithful, diverse, cosmopolitan Christianity in the Roman world, and that Christianity is still there, alive, and hanging on. Projects like this show that it is a witness that has much still to teach us.